When learning how to cook mahi mahi, it is important to know that this fish is actually a dophinfish. It is referred to as mahi mahi not to confuse this dophinfish to the marine dolphins which is unrelated. This fish is one of the most popular fish being served in some restaurants. Before I learned how to cook mahi mahi, I knew of many who went fishing for them. I had always heard how pretty this fish is having such a stream lined body. They are silver in color and have gold and black spots. How could one kill and eat something so pretty? After eating it one time, I knew that answer. The smaller fish are sold whole but the larger ones are cut into steaks and fillets to sell. Although this fish can be fried, broiled and often put into pies, I love them over a charcoal grill. The name “mahi mahi” is actually a Hawaiian term meaning “strong”; referring to their fighting ability. This warm water fish is known for its sweet mild flavor with firm white meat; very popular at the Outback Restaurants. Because of its mild flavor, it will blend well with many other ingredients and sauces. 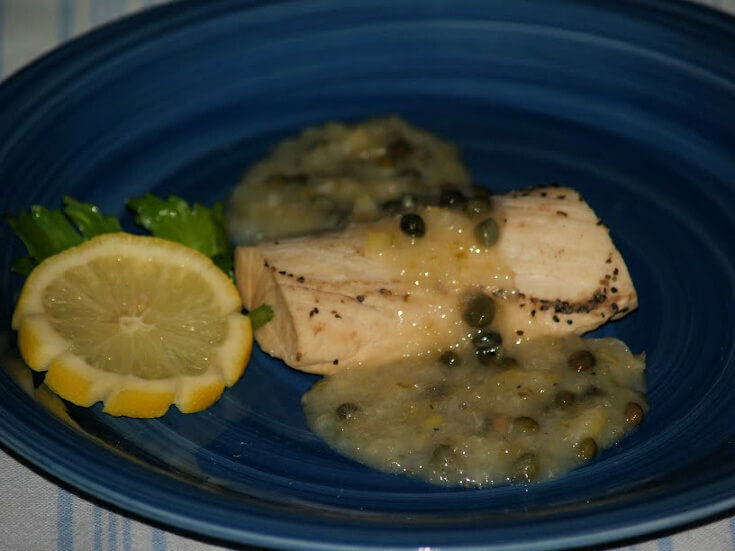 Learn how to cook mahi mahi with a wine caper sauce. Place celery, onion, bay leaves and lemon in bottom of shallow pan. Place the fish on top; season with the salt and pepper. Pour the water and wine over the top; slow simmer on stove top for 20 minutes. NOTE: Liquid should be hot enough to bubble not a rolling boil. Remove fish from liquid to a warm platter; keep warm. Remove bay leaves from liquid; process liquid and solids in food processor. FOR SAUCE make a roux with the flour and butter. Add the liquid processed mixture to the roux; stir until thickened. Stir in the capers and serve over the fish; serves 4 to 6. Learn how to cook mahi mahi in the microwave. Cut in tomato quarters; place on microwave safe plate. Place in microwave on HIGH for 2 minutes; remove skins and chop. Place onion, garlic, tomatoes and oil in shallow microwave dish. NOTE: Shallow dish should be large enough to place fish in a single layer. Heat onion mixture on HIGH for 5 minutes; add cayenne and mix well. Arrange the mahi over the mixture; sprinkle with the lemon juice. Cover dish with plastic wrap piercing top 2 times; cook on HIGH 6-8 minutes. NOTE: Mahi should flake easily when tested with a fork. Serve with sauce spooned over top; garnish with parsley and the lemon slices. NOTE: I served my mahi mahi with spinach in the picture. Prepare sauce by combining all ingredients except fish and paprika. Spread on both sides of the fish. Turn fish over and brown the other side. Heat wine and lime juice in saucepan. Simmer until amount decreases to half as much. Remove from heat and stir in the ½ pound of butter. Set sauce aside to cool and thicken. Lightly dust Mahi with the flour. Sauté in butter and oil until lightly brown. Sauté the red pepper, zucchini, squash and mushrooms in the 3 tablespoons of butter and oil. Spoon on the cooked vegetables, ladle on the sauce and garnish with fresh chopped dill. 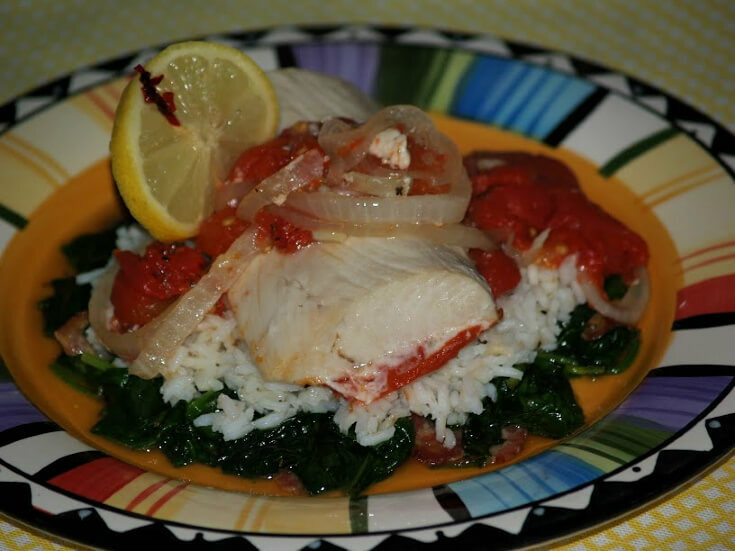 When you are just learning how to cook Mahi Mahi this is one of the easiest recipes. Sprinkle the fish with salt, pepper and paprika. Place fish in a 9x13 inch baking pan. Place a ¾ inch sliced tomato on top of each fish filet. Sprinkle each slice with the green onion, Cheddar cheese and parsley. Bake uncovered for 20 minutes or until fish flakes. When you learn how to cook Mahi Mahi this is one of my favorite recipes. Cut fish fillets against the grain in ¼ inch thick slices. Heat 3 tablespoons oil in heavy skillet; add salt and ginger root and stir fry few seconds. When oil is near smoking add fish; stir fry gently 1 minute until half done and remove to plate. Heat remaining oil; add bean sprouts and stir fry 1 minute. Add scallions and soy sauce; stir mixture few times. Add stock and bring to a boil; return fish and cook covered over medium heat about 2 minutes until done. Blend cornstarch and cold water into a paste; stir into sauce to thicken it. Learn how to cook mahi mahi with avocado corn salsa. First make sauce by combining all sauce ingredients; toss gently together. Cover and refrigerate for 1 hour before serving; makes 3 cups. TO COOK FISH lightly brush fillets with olive oil. Season to taste with ground peppercorns. Soak a handful of mesquite wood chips. When ready to grill fish throw wood chips on hot coals. Grill fish for 5 minutes on each side; serve with avocado corn salsa. NOTE: For a deeper smoky taste cover the grill while cooking the fish. Learn how to cook mahi mahi with white wine sauce. I was told this recipe came from Harvey’s Bistro in Orlando Florida but I am not sure. TO MAKE SAUCE combine wine, juice of 2 limes plus the rinds in a small saucepan. Simmer until only about 1/8 inch remains in the pan. Discard rinds from sauce and set off heat. Beat in softened butter a little at a time; set aside. NOTE: Sauce will firm up as it cools. TO COOK FISH PREHEAT OVEN to 350F degrees. Lightly dust the mahi mahi and scallops with flour. Heat 3 tablespoons of butter and 3 tablespoons of oil in large skillet. Sauté fish and scallops until lightly browned; move to pan and place in heated oven 5 minutes. Add 3 tablespoons butter and 3 tablespoons oil to skillet; heat. Add zucchini, squash and mushrooms to skillet; sauté 3-4 minutes and season with salt and pepper. Stir in cooked macaroni and pepper strips until blended and pasta is warmed. Remove fish from oven and sprinkle with juice of 1 lime. Place pasta and vegetable mixture on a large platter; top with mahi mahi and scallops. Ladle sauce over the top; garnish with fresh dill. 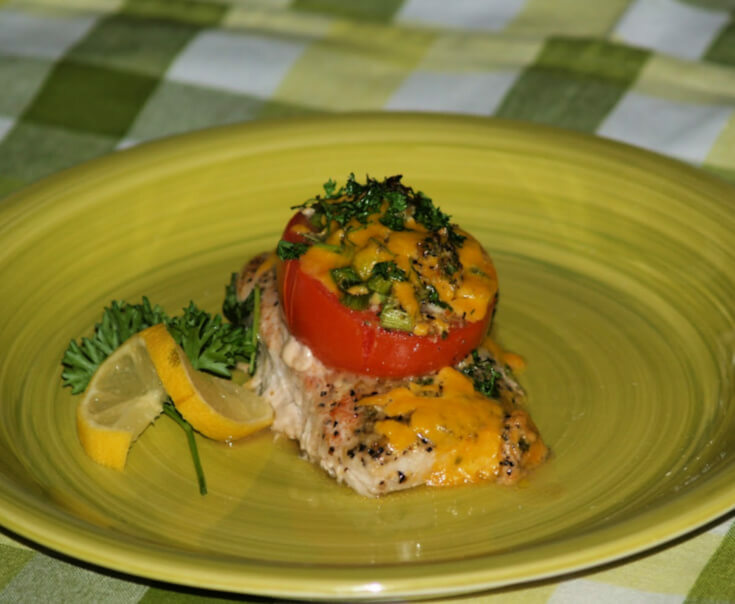 Learn how to cook mahi mahi with great flavor. Add green onion and the next 9 ingredients to skillet. Cook 2 minutes stirring occasionally; remove from heat. Place fish in a greased 13X9 inch baking dish; pour onion mixture over the fish. Top with chopped tomato; sprinkle with paprika and seasoned salt. Bake about 25 minutes or until fish flakes easily when pierced with fork. DISCARD bay leaves and serve immediately; serves 6. Learn how to cook mahi mahi spread with delicious flavors. Place fish in oiled 9X13 inch baking dish. Combine and blend mayonnaise and cheese. Add remaining ingredients to mixture (Except wedges). Spread mayonnaise mixture over the mahi steaks. Bake for 25 minutes until fish flakes with fork. Garnish with lemon wedges; serves 4 to 6. Learn how to cook mahi mahi seasoned with a spicy Middle Eastern flare. Melt butter in skillet over medium high heat. Add green onions and next 9 ingredients. Cook 2 minutes stirring occasionally; set aside off heat. Place steaks in lightly greased 9X13 inch baking dish. Pour skillet mixture evenly over fish steaks. Top with tomato; sprinkle with paprika and seasoned salt. Bake 20 to 30 minutes until fish flakes; serves 6.